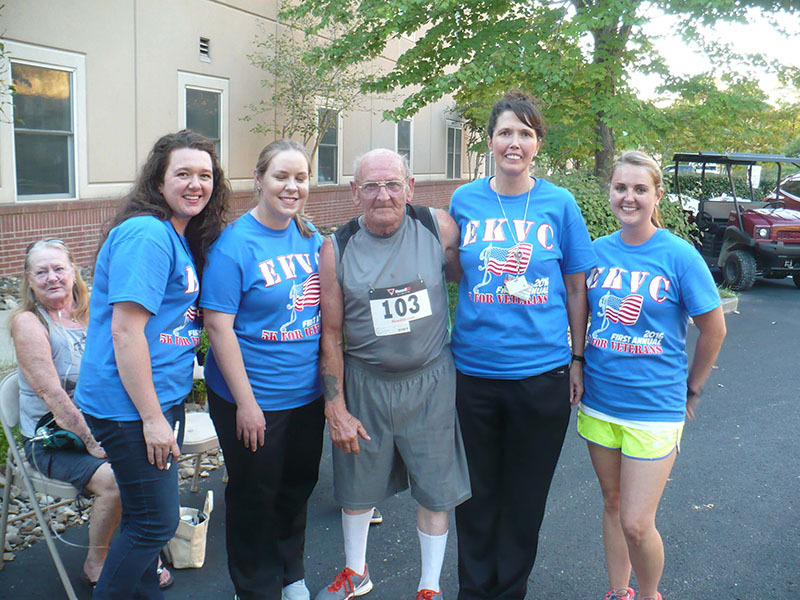 The rehab team at the Eastern Kentucky Veterans Center (EKVC) recently organized and sponsored a 5k walk/run in honor of past, present, and future veterans. All proceeds from the event went to the EKVC Residents’ Fund, which allows residents to participate in community events and outings such as shopping trips, local festivals, and fishing excursions. There were more than 50 participants in the 5k, including several resident veterans – one of whom completed the 5k in 35 minutes! A presentation of the colors was performed by the JROTC from Perry Central High School, and EKVC veterans led the crowd in the Pledge of Allegiance, followed by a prayer. EKVC was honored to shine the spotlight on their resident veterans as well as community members who have served their country. With the help of community members and friends, the campus raised more than $2,000! Special thanks to everyone at EKVC who helped make this event possible!